Artificial Grass is an ideal surface for trade fairs, exhibitions, corporate event, wedding receptions, tv adverts and photo shoots. Synthetic turf surfaces can create a fresh edge to any event. Why not give fake grass a go and produce a fun aspect to your design? We offer our Classic, Ashton, Deepdale and Selhurst ranges for hire on a self install basis to any UK mainland address for 1-5 day events. Installation can be also be arranged to be carried out by a 3rd party contractor anywhere in the UK. Just click on the link below to download our hire application form. Complete the form and return it to us with a plan of the area you wish to cover, we'll get back to you with a quotation. No problem if you call us by 3pm we can have you grass on site by 9am the following working day. Just give us a call and we will provide you with a quote to cover your area. A short and durable product, ideal for high footfall, sports or outdoor use. Excellence for covering large areas quickly and easily. A 25mm pile of multi-colours of greens. Great for a real life grass effect with a deep green colours. Adds a brown grass to the base of the product to give a more natural look when used for close up photography. 35mm of pile. Roll out and brush and it will create the most natural looking grass both close up and from a distance. 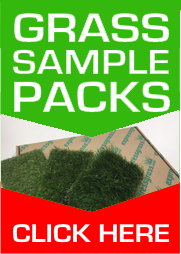 This is the one to go for if you want to acheive the best possible likeness to natural turf. Please complete the Hire Application Forms to obtain a quote for hiring our fake grass.